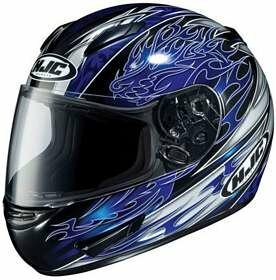 HJCs CL-15 Full-Face Helmet is a popular choice with everyone from new riders, to the budget conscious crowd, to the advanced "price is no object" crowd. CL-15s come in all sorts of design and color schemes. This particular one is called the Dragon. The namesake may have something to do with the fact that there is a pretty wicked-looking flaming dragon gracing both sides of the lid. The design is sharp and the dragon avoids a cheesy cartoon look. As far as features go, the CL-15 has most everything you'll need. It's made of an injection-molded polycarbonate composite shell. It also has a pretty effective venting system with two intake vents up front and an exhaust in the rear. It also has a removable liner and anti-fog shield (with a nice selection of color options sold-separately). Speaking of the shield, HJC has a pretty slick removal system that makes cleaning or replacing it a snap. The CL-15 is DOT-218 and SNELL-M2005 approved so you can rest assured that your dome is safe. Weighing in at about 3.6 lbs, it's not the lightest helmet out there but it's not the heaviest, either. All in all, the CL-15 is a good helmet that is priced right and is very popular for a reason.